LFR 528F is one of a batch of 40 Titan PD3A/1 vehicles with MCW H71R bodywork, delivered to Blackpool Corporation in 1967 and 1968. Some of the later 1968 vehicles had the G suffix to their registrations. 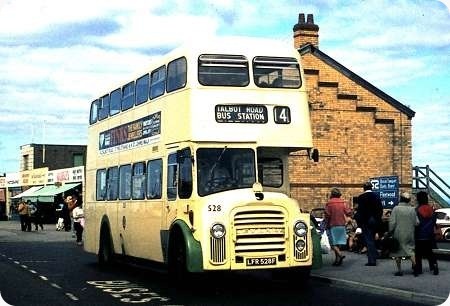 528 is seen in the old almost-overall cream livery at Fleetwood on 15 September 1975, while on the 14 between Fleetwood and Talbot Road Bus Station. I sampled the current version of this service in May 2013, and it’s a lot quicker to use the tram from the stop by the Knott End Ferry beyond the bus to North Pier! I know it’s an Orion – but it’s a handsome one. Light colours flatter it. Blackpool being Blackpool, how long did they last? Still running?! Joe, No! Sadly it’s only some of the trams of similar and older vintage that are still in service, not the buses. Nice photo: the bus fleet inevitably gets overshadowed by the tram fleet. I agree that the Orion looked better in lighter colours. That open radiator flap must have worsened fuel consumption! I beg to differ about there being no Blackpool PD3’s still active. 529 is still very much active, mostly doing private hires for Classic Bus North West. But it did operate the full shift on service 22 on the 25th of May this year, this being the day that also saw RM1568 and 1947 built Lytham 19 doing a planned Heritage Running Day on that service. What a terrible livery that was. Indeed, it would be wrong to use the word livery. Just dump a bus into a tank of cream paint and dab a bit of green on the mudguards. Thank goodness more green (and more sanity) returned to this fleet after a few years. Mr Anon, still active? Yes, but not in normal every day service with the original operator. I know of several that are preserved in different places. Blackpool’s bus life has generally been around 12 years. Not strictly true the age profile. Most of the Atlanteans were between 20 and 25 years old when withdrawn, the ex WYPTE Olympians were just about 30 years old, and the F*** UFR Olympians were just about 20 years old on retirement. The 12 year life has long since passed into oblivion. For the record, Blackpool Transport’s last few PD3s were retired from regular passenger service exactly 25 years ago this month. Here is another Blackpool PD3, consecutive registration No to the one shown above, this was taken June 15th this year at Ribble Steam Railway, Father’s Day, Vintage Vehicle Show. Blackpool were really into the full frontal look I think it was to make them look like the trams that Blackpool is famous for. Before these normal looking full frontal Titans they had other versions which they classed as ‘streamlined’. The bodies were built by Burlingham a local body builder, I think they were bought out by the better know company called Duple. There is a photo of a ‘streamlined’ Blackpool Leyland Titan here. This photo is clearly of 334 (PFR 334), not 344. Good pic, though. 334 was one of a batch of 30 numbered 331-350. The 1960 abc British Bus Fleets No.6 (Lancashire), shows the seating as 61, reduced to 59 in the summer (for increased luggage space?). Burlingham were based in Blackpool and after the Duple takeover, the factory was known as Duple (Northern). Thanks for that, new glasses required I think, I have altered the heading so it is now correct. Does your 1960 abc book have the above vehicle as a PD2/27 as my 1965 version because the website ‘Bus Lists on the Web’ has it has a PD2/40? Can anyone solve this anomaly. 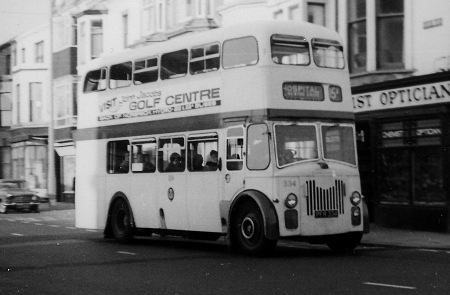 In "Blackpool’s Buses", by David Dougill, the fleet list shows 301-305 as PD2/21 with Burlingham bodies, while 306-310 had MCW bodies. 311-350 were PD2/27 with MCW bodies. "Trams and Buses Around Blackpool" by the well-know duo Steve Palmer and Brian Turner gives the same detail. The only difference between 311-330 and 331-350 is that the earlier numbers were delivered in 1958 and the later ones arrived in 1959. Chris, I’m no Blackpool expert but do I recall in the murky recesses of the mind that sometimes "exposed" radiators with smaller blocks were provided for certain full-front applications? Does that clarify – or muddy – the waters? 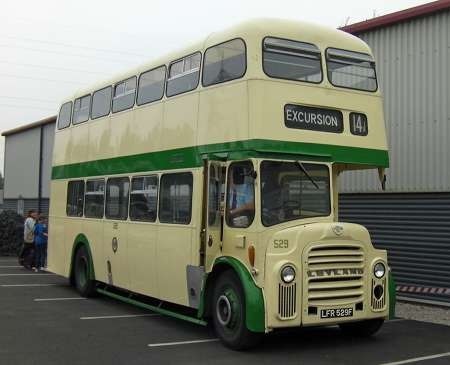 This bus survived longer than most of its classmates as, along with 337, it was converted for use a Permanent Way staff bus in which guise they were numbered 434/7 (346 also worked for the Electrical Services department). From my time at Blackpool I have a 1978 fleet list which shows these as PD2/27s which entered service on 25th and 26th March 1959 respectively. Blackpool 334 was a PD2/27 as David Beilby confirms. To answer David Oldfield, Leyland supplied the ‘exposed radiator’ version of the Titan for full front designs where the front grille was part of the body design rather than being one of Leyland’s standard fronts. Examples are Ribble’s PD3’s with Burlingham and MCW bodies and the Southdown ‘Queen Mary’ Northern Counties bodied PD3’s. They were PD3/4 and PD3/5’s. As Blackpool used both the standard Leyland BMMO and St Helens style bonnets in their full fronts these Titans were the concealed front chassis types, PD2/21,PD2/27,PD3/1 and finally PD3A/1. The latter had the asymmetrical front windows with the nearside windscreen ‘drooping’ down to follow the shape of the St Helens style bonnet. This arrangement was also used on PD3A/2’s operated by Bolton Corporation with both East Lancs and MCW forward entrance bodies. I was the last driver of PFR 339, one of the buses mentioned in the above article. 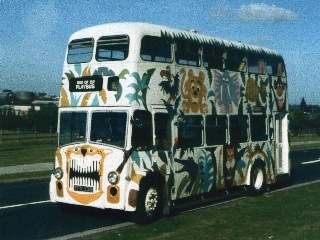 It was being used as a play bus for the Wisbech area and survived in a working state until 1982. It used to move from one school to another in this area to provide a base for play schools in village where none existed. Gradually these village were able to form their own playgroups in accommodation of their own so PFR 339 worked at achieving it’s own demise. Eventually in 1982 it stayed in one school for a few years as a permanent base, but was eventually replaced by a more suitable form of accommodation. Clement Freud and his wife Jill were instrumental in setting it up in the first place. When I were a nipper as the saying goes me, my sister took a day trip to Blackpool. We went by Ribble X61, a DP Leyland Leopard out and a White Lady Atlantean (RRN reg) back to Liverpool. We had a ride on a Balloon tram (two 1s, two 6d). We kept the ticket for years,it was a TIM issue. From the tram ticket we got the date 8th August, 1968. In my opinion the St Helens bonnet didn’t suit a full front, which Blackpool Corporation recognised by specifying half cabs for 381-399 and 500-540. The 1950s Leyland Titans would have looked better with a Ribble style grille, but I guess BCT wanted to be different! .